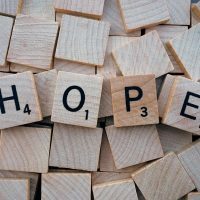 Before you take a step, before your situation changes, before you even have the answers to create change…you just need to grasp the concept of hope. You have to know there is a chance for something better and then allow the story to unfold. Trust me…it’s easier said than done, but it has to be done. In November 2015, my business journey shifted. I was holding onto a fledgling cookie company as if it were a million dollar operation when in reality it was only generating enough revenue to be a mere side hustle. The cookie company had the potential for growth, but I didn’t have the capacity to breathe life into it. That is until my expectations shifted and I settled for the uncertainty of what if there is more? On July 31, 2018, I celebrated the result of taking a chance on hope, through the brand unveiling and business launch of my cookie company, now known as Junita’s Jar. Surrounded by walls and books and periodicals dedicated to all things business development and standing under the portrait of the well known dreamer and entrepreneur, Mr. James J. Hill, I stood before one hundred or so friends and supporters sharing the news of the next chapter in my journey of entrepreneurship. I stood before them as I stepped into the intersection where the uncertainty of hope meets the power of a dream. Filled with table of cookies and conversation starters, my business launch was designed to introduce our deliciously wholesome cookies while creating the opportunity to exchange hope-filled interactions. From four amazing speakers, each sharing their personal story of trauma to triumph, Junita’s Jar welcomed a movement celebrating the impact of hope. Some had tears of inspiration others had hearts overflowing with the anticipation of doing good, but everyone understood the powerful impact of hope-filled communities. Launching a business is grueling work. Launching a movement of hope-filled possibilities makes the work a little sweeter. As I reflect upon my business journey over the past three years, and think about what I know for sure, I can tell you three important business altering lessons that have dramatically impacted my growth. You must say yes to the difficult things. Build your network to increase your net worth. Celebrate the small steps along the way. I could share story upon story that speaks to the growth I’ve experienced from these three lessons, but I’ll save that for the book. In the meantime, I want to send a special thank to the community of supporters and friends for joining me on this journey and a special thank you to the James J. Hill Center team for creating an opportunity for me to say yes. As always, I would love to hear from you. Send me an email or share via social media, your story of embracing hope and executing your dream. At the end of the day, remember hope is a game changer.